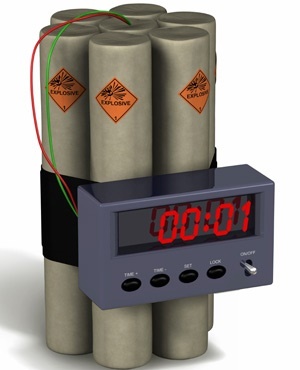 There was pandemonium on Monday at the Anambra State Secretariat of the Independent National Electoral Commission, following alleged discovery of an explosive package suspected to be a bomb. There was tension at the Anambra State Secretariat of the Independent National Electoral Commission (INEC) on Monday after some explosives were reportedly discovered. The development comes five days to the governorship poll in the state. It was gathered that the bomb disposal experts and policemen trooped into the premises with the explosive reportedly planted close to the INEC gate. Further reports indicate that staff of the body ran for safety following the incident. However, the INEC Resident Electoral Commissioner (REC), Nkwachukwu Orji, said he was not aware of the development. "I don’t think I know what you are talking about," the REC said. Some officials of the electoral body, however, confirmed the incident. "All of us ran away when the story broke. We were all scared to stay in the offices until bomb experts came an detonated the device. “Let this election come and go, so that that we can rest. This is scary," one of them said. When the police was contacted, the State Police spokesperson, Nkeiruka Nwode, said she was not aware of the incident.